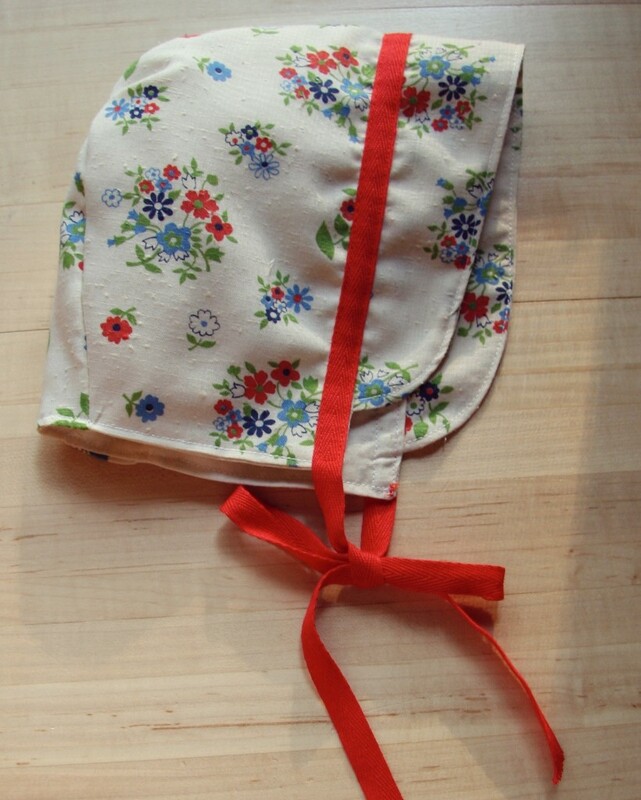 Amy sent out an email yesterday to her mailing list announcing that her bonnet pattern reprint is now available! That totally reminded me of this project I’d been wanting to do. I want to have a shaker peg rack full of bonnets for Phoebe’s room. I was inspired by another photo from the Collecting American Country book (the first inspiration being the doll quilt wall) and also the shaker nursery in Martha Stewart baby. As a card carrying mail order club member I already have my bonnet pattern so I got started last night and ordered my peg rack and finished my first bonnet. Talk about immediate gratification. I love this pattern! Oh, man. She’s totally the perfect ad for the bonnet pattern! That is one cute little baby! I love your fabric…it makes the bonnet! gorgeous! i didn’t know about mail order (or craft blogs, for that matter) yet by the time original mailorder came out, but i can’t wait until i get it now!! did you use baby or child size or one in between. Phoebe is just too cute, and you’re having entirely too muich fun sewing and dressing her up. Such a cute little girl. The bonnet idea is just great. It’s perfect! And you know, I like your quilt wall even better than the original. I can’t wait to see your bonnet peg rack! and what a perfect little model for such a cute bonnet. Her bonnet is adorable! A peg rack with little bonnets is a lovely idea. I look forward to seeing a picture of that. @(&^#! * if I have another baby it will be your Phoebe’s fault for being so cute! She is still the only sweetie to give me the twinge. I can’t imagine how bad it would be if I knew you in person! great bonnet! I have been waiting for the pattern to come out and ordered one today! Phoebe looks great in hers! Boy, you are fast! Nice work! and thank you so much for the bonnet pattern love! So cute! Babies as cute as that in bonnets as cute as that will bring them back into style (or are they in style, just not in Florida?)! So beautiful! I love the red ribbon! Oh she is so beautiful in that bonnet. Her cheeks look so kissable in it. How adorable!!! We live in “bonnet country (Amish)” but yours is so much cuter!!! Oh man i literally “awed” At Pheobe! And i dont do that so thats saying something! She’s adorable & so is your bonnet! pretty much couldn’t be any cuter. the bonnet or the baby! Thanks for the awesome display idea. I already have a peg shelf hanging in my daughter’s room. And I can fill it with the collection of bonnets made for her by my mother (hand tatted lace and smocking) and the ones I wore as a baby! I can’t wait. Gracious that’s a cute baby! Pheobe looks adorable in that bonnet! 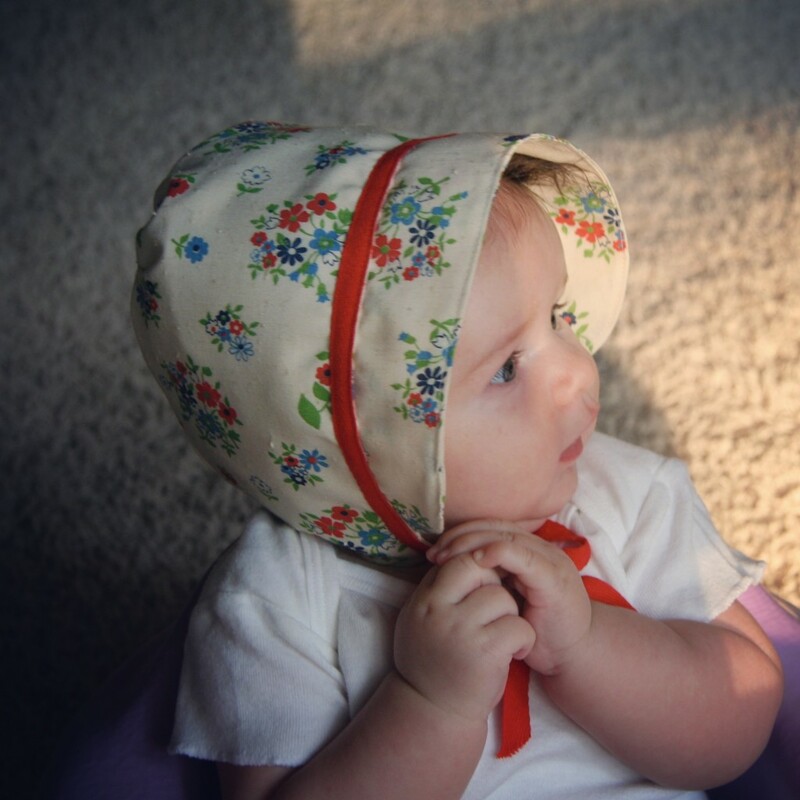 Makes me wish I had a little girl so I could create a bonnet wardrobe! oh goodness, that baby! xo. Hey you have been taged. Visit my blog for more details. Great idea. Those baby cheeks are just killing me. That fabric is adorable and the baby even more so. oh, beautiful girl! beautiful, beautiful, darling, baby girl! what a sweet surprise when the page opened. well, that pattern is winner. Wow, that’s the most dainty beautiful little bonnet I’ve seen. she is such a hunny! Absolutely adorable!!! Love that bonnet pattern, but the baby, the baby is way too cute! I didn’t think I could want a girl more than I already did…Eisenhower was dressed in a bonnet until he was five, right? I happened to be browsing patterns in an actual store yesterday and saw that Butterick’s (I think) makes a bonnet pattern, too. It’s a bit more elaborate and…I don’t know, pioneer woman-looking or something. I like this more streamlined version better. I love your blog, by the way. A few days ago, I posted a picture of a new baby quilt based on one of your doll wall quilts. Thanks for the inspiration! oh, my that bonnet is cute on her beautiful little head! That bonnet is awesome. What a cute little model too!